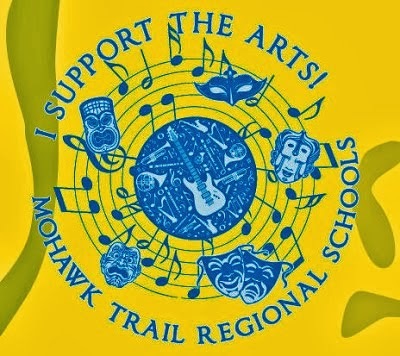 Mohawk Music Association meeting at 6:30 pm in the library. All are welcome to attend. ● Thank you to all who came to our Winter Concert on December 17! It was great to see such a large audience and all ensembles did a great job. What a wonderful way to celebrate this joyous holiday season! ● Middle School music students Lily Wickland-Shearer, Mae Rice-Lesure, Guy Rice-Lesure, and Ella deBeauport were recently accepted into the Western Massachusetts Junior District Festival Chorus. Students auditioned on Saturday, December 5th at Westfield State University. In March these students will spend 2 Saturdays at an all day rehearsal followed by a performance on March 14th at the Fine Arts Center at UMASS. Students from all of Western Massachusetts auditioned for the various ensembles. Congratulations Lily, Mae, Guy and Ella! ● On Tuesday, December 23rd the Middle School Chorus and 8th grade Band students performed at the Shelburne Senior Center. This performance featured concert selections from both ensembles, as well as a sing-along of well-known carols. ● AFTER VACATION: Middle School Band and Chorus students will be busy! We will begin working on music for our March 27th performance at the Springfield Falcons Hockey game. Band students will be performing “pep band” music on the concourse, and Chorus students will perform “God Bless America” on the ice prior to the game. This is a fundraiser for the middle school music department. Students will be selling tickets for $15, with a $3 profit per ticket for the music department. If you are interested in purchasing a ticket and supporting the middle school band and chorus please contact me at gglover@mohawkschools.org or see a middle school music student! ● Happy Holidays from the Music Department! We hope you all enjoyed a wonderful holiday and students have a happy and safe winter break! Looking forward to Seussical in March! Nearly one hundred students are involved in the cast and crew of this year’s all-school musical production, which is scheduled for March 6, 7 and 8. Shelley Roberts is the Director/Producer of our All-School Musical which brings together students from our elementary schools as well as students here at Mohawk.